The term holistic medicine is very broad and confusing. It can include anything from Eastern medicine to the real meaning of the word, namely the whole body. I prefer to work with the term the whole body. And why? Because the body is a unit, not different parts that each functions on its own. Do you agree? From that vantage point, it becomes much easier to discuss various ways of healing the body. Your colon is, well, your colon. It is designed to get rid of the food (and junk food) that your body did not need to function properly. Right? Well, partly right. Your colon is also the place where all the systems and organs in your body are regulated. 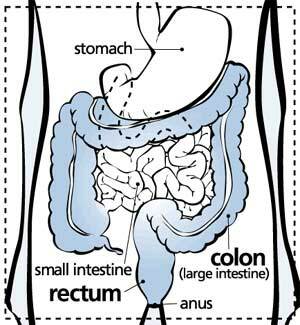 Each part of your colon has a corresponding organ or system that it watches over and reflects the condition thereof. Ever heard about Colon Hydrotherapy? How can Colon Hydrotherapy help other organs? Colonics stimulate reflex points. Every system and organ of the body is connected to the colon by reflex points. A colonic irrigation stimulates these points, thereby affecting the corresponding body parts, organs, tissues and glands in a beneficial way. Colon Hydrotherpay also helps nutrient absorption and provides a healthier environment in which your beneficial bacteria can grow. If you are experiencing constipation, diarrhea, irritable bowel syndrome, gas, bloating, indigestion, yeast infections, skin problems, frequent colds or flu, fatigue, headaches, allergies, Chronic Fatigue Syndrome or Fibromyalgia, you would greatly benefit from a series of colonics. # Heart and tip of the nose. # Small intestine and the lower and more central portion of the forehead, and the inner section of the lower lip. # Kidneys and the ears, and a circular area encompassing the region above and below the eyes. # Bladder and the top portion of the forehead along the hair line. # Spleen and pancreas and the portion of the nose closest to the head and the left eye. The spleen also correlates to the temples. # Stomach and the central portion of the nose, and the upper lip. # Duodenum and the outer corners of the mouth. # Liver and the area of the forehead between the eyebrows, also the right eye. # Gall bladder and the area between the end of the eyebrows and the sideburns. # Sexual organs and the area encircling the mouth. Can you see what I meant by holistic? Link to the pages below for more on holistic ways to care for our amazing bodies. To review a similar but also a slightly different approach to holistic medicine you can visit this link. What is the possible causes of my stomach pain? Is it advisable to have seasonal flu shots?